The Black Magic Series of bags is one of the most luxurious in our line. 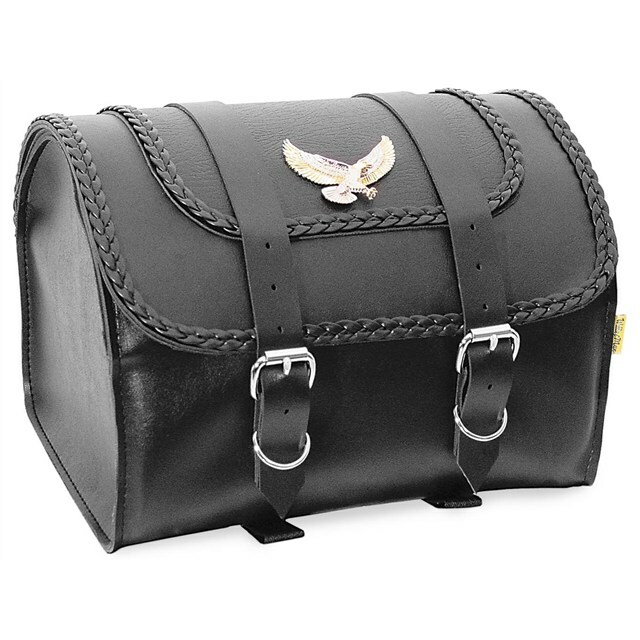 These bags have everything: rich black synthetic leather, highlighted with deep-grained synthetic leather, 3-strand braid and a large 3” gold and silver eagle. All of the Black Magic bags are plastic reinforced for greater shape retention. The bags are closed with genuine roller-pin buckles and internal snap flaps offer security. The saddlebags are secured by either heavy-duty cable ties and/or laces, both included. The tool pouch is secured with hook-and-loop straps and the sissy bar bag mounts with the easy-tie-on lace system. Designed to match most Willie & Max saddlebags. Large main compartment, plastic reinforced, with double buckle closure. For proper mounting, use 2” hook-and-loop straps and all 4-lace tiedown tabs (laces included). The Max Pax must be supported by a fender luggage rack.